Containing everything a self-assured, intelligent female could ask for in a magazine, a Woman & Home magazine subscription is your perfect lifestyle read. Providing engaging articles on home, fashion, beauty, travel, health, career, entertainment and food, Woman & Home really offers the full package. 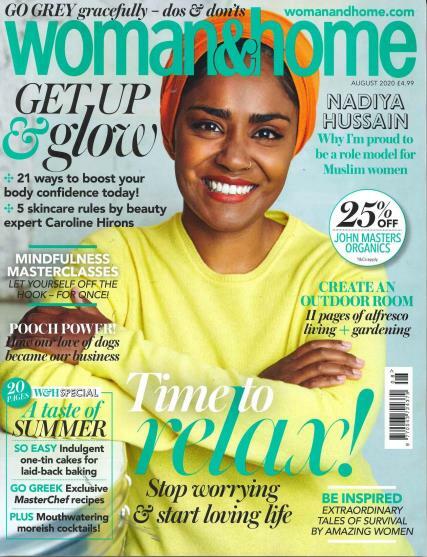 Projecting positive messaging throughout its content, in every issue Women & Home shines a spotlight on real, inspiring women - reaffirming throughout that life is about attitude, not age. As part of this, you can find fashion for every shape and size and regular problem solving beauty features. Woman & Home is the fastest-growing lifestyle publication for women and it’s easy to see why with the engaging mix of content. In addition, Woman & Home subscribers can benefit from its own Diet Club which goes so far as organising exclusive events throughout the year for its readers. As such, you can be guaranteed advice on exercise and wellbeing that will help you feel amazing inside and out, and a host of delicious, healthy recipes to inspire you in the kitchen. So step out with confidence today helped by a Woman & Home subscription. Enjoy reading about reader's success in business set ups. Health matters/challenges as my background has been with the NHS. This magazine is perfect for me - a busy mum with a job and 2 kids to look after as well as a house to run. Lots of the articles are designed to help make that easier and I've certainly benefitted from tips and advice on everything from packed lunches to saving money and from great ideas for holidays to makeovers for me and the house! My wife really enjoys this magazine and looks forward to it's arrival every month.